It is prohibition era in New York City. Rival gangs of mobsters use their influence to bribe politicians, run casinos, bootleg liquor, and gain the favor of corrupt policemen. In Capo dei Capi, players compete to decide who will be the 'boss of all bosses.' 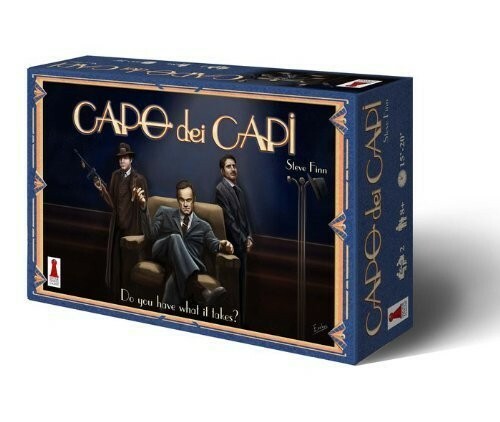 Capo dei Capi is a 2-player dice game that requires players to 'push their luck' each turn as they make tactical area control decisions. It is designed to be a very quick filler game (~15 minutes) that still demands skillful and crafty decisions. Yet, because dice rolls are unpredictable, players must be prepared to adapt and change their plans at the drop of a die. "I don't think this is its own, unique game design...."
"Playing in a large group is always hard, as the..."
"My favorite game. I love this game. For..."
"This is simply put one of our era's finest games...."